Twice a year, when you get your dental checkup, does your dental hygienist tell you that you’re doing a great job – or are you told that you need to do better? Even conscientious adults often have a difficult time getting all of the plaque off of their teeth. Scientists and physicians have linked periodontal bacteria to increased risk of heart disease, so it’s important to properly clean your teeth and gums daily.Fortunately, there are a number of products on the market today that are designed to help you improve your dental health by targeting plaque. One of the newest and most innovative products on the scene is Plaque HD Toothpaste. This toothpaste turns the plaque on your teeth green as you brush, so you can see it in real time and get more of it off your teeth. It’s a great tool for the entire family, and one tube of this toothpaste can last for several months if used weekly as an oral hygiene tool. Click to see Plaque HD Toothpaste. Several manufacturers make products specifically to reveal the plaque on your teeth. A few drops of Trace Disclosing Liquid on a cotton swab turns the plaque on your teeth red, allowing you to see where your brushing falls short. You only use a drop or two, so a bottle of Trace can last for many months, depending on how often it’s used. Click to see Trace Disclosing Liquid. Two-Tone Disclosing Tablets are chewable tablets, which reveal the plaque on your teeth. Just chew one tablet and spit out the excess. Two-Tone Tablets turn old plaque blue, and new plaque red. 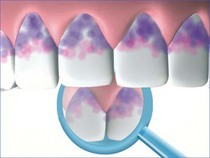 So you won’t only see where the plaque is on your teeth, you will see where you miss brushing the most often. Click to see Two Tone Tablets. Several companies make a mouthwash that you can use either before you brush to help loosen plaque, or after you brush to help prevent plaque from forming. Some examples are Plax Mouthwash, GUM PerioShield and Biotine Moisturizing Mouthwash. These can be useful, but they do not address the underlying problem: understanding where your brushing routine may have shortcomings. Most of these mouth rinses don’t reveal plaque, and may give you a false sense of confidence. Still, they can be a good part of your oral hygiene routine when used with other product to reveal the plaque left behind. No matter what tool you use to improve your oral hygiene routine, it’s a good idea to double-check yourself from time to time. Keep your teeth healthy, and they will last you a lifetime.